The Parking Department is located at 1201 West University Avenue, Urbana, IL 61801 and can be reached at (217) 333-3530. 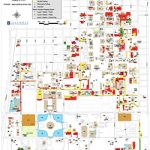 Regular hours of operation is Monday – Friday 8:30 a.m. – 5:00 p.m. You can pay citations, appeal a citation, or get a copy of the campus map by visiting: www.parking.illinois.edu. As a courtesy, the Parking Department has allowed ARC patrons to park in lot E24 Monday-Friday from 6:15-8:15 am without having to pay the meters. Meters: $1.00 per hour; $.25 =15 minutes; $.10=6 minutes; $.05=3 minutes. Pay by Phone: Available at most University of Illinois meters. Learn more about this convenient service at paybyphone.com. Daily Meter Permits: These hangtags are good at any U of I meter only and may be purchased for $12.00 by coming to our office location or pre-order. Virtual Temporary Permits: These permits are lot specific (E14 or F23) and may be purchased for $14.00 each by calling 217-333-3530. Individuals can park in any lot that is not a 24-hour permit only lot after 5:00 p.m. to 2:00 a.m. Monday-Friday and Friday until 6:00 a.m. Monday. The Parking Department accepts cash, check, and all major credit cards. Where can I park at the ARC? Metered spaces are available in the lot just west of the ARC (Lot E24) as well as along Peabody Drive in front of the building. Additional metered spaces are available on Fourth Street and in the Krannert Art Museum lot (E19) and the Law School lot (E15.) Patrons with a Lot E24 hang tag may legally park in the metered spaces. Note: The parking lot directly across the street from the ARC entrance (Lot E38) is a 24-hour permit-only lot. You will be ticketed or towed unless you have the appropriate permit. Where can I park at CRCE? Metered spaces are available along Dorner Drive, Peabody Drive (24/7) and in Lots F28 and F6, just south of the parking garage. Note: The Allen Hall parking lot is a 24-hour permit only lot. You will be cited unless you have the appropriate permit. Where can I park at the Ice Arena? Metered spaces are available along Fourth Street and Fifth Street seven days a week. Where can I park to access the Illini Grove? Metered spaces are available along Pennsylvania Avenue, Dorner Drive, Virginia Drive and College Court. Where can I park near the Complex Fields? Metered spaces are available along Lincoln Avenue. Permit parking is available in Lot F23. Note: The gravel drive at the Veterinary Medicine Building or along St. Mary’s Road is not available for parking at any time and may be cited and towed. Where can I park at the Outdoor Center Fields? Metered spaces are available along Stadium Drive, Gregory Drive, and Oak Street. Metered parking is also available in Lot E24.